Protein is a vital nutrient your body needs every day. Simply Protein is a great tasting and convenient way to keep protein levels topped up as part of a balanced diet and active lifestyle. Whey is a natural product, derived from milk as part of the cheese making process. It is a complete protein meaning it contains all the essential amino acids required to support muscle maintenance in an active lifestyle. Whey protein is also a fast digesting protein making it an ideal protein source following any physical activity. Whey is versatile and can be taken with water, milk or even blended with fruit or non-fat yoghurt. For adults blend one 70ml scoop to 240ml of water, juice, milk or yoghurt. For best results, use an electric blender and once mixed the product should be consumed within 20 minutes. For best results take one to three servings daily. You can drink Precision Engineered Simply Protein any time during the day to add extra high quality protein tp your kilocalorie intake. Be sure to figure the extra kilocalories provided by milk, juice, yoghurt or whatever you may add to your Precision Engineered Simply Protein. Whey (Milk, Soya) Proten Concentrate, Strawberry Flavouring (Maltodextrin, Emulsifier (Acacia Gum),Anti Caking Agent (Silicon Dioxide) Flavouring),Malic Acid, Colour (Beet Juice Powder), Sweetener (Sucralose), Citric Acid. Ensure adequate hydration during and after training. Minimum of six to eight glasses of water daily. 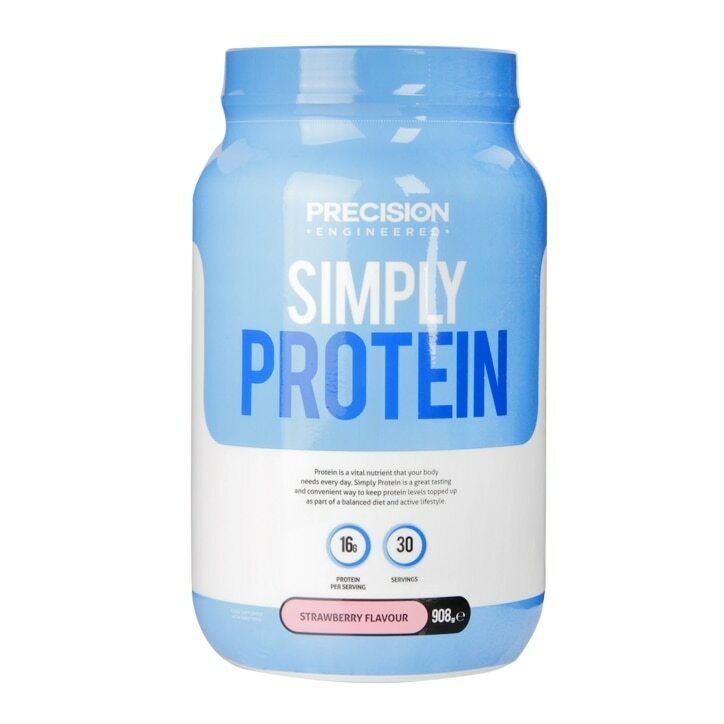 Precision Engineered Simply Protein Powder Strawberry is rated 4.3 out of 5 by 3. Rated 4 out of 5 by Tjeans from Great taste/quality Great taste and quality. I have a shake after a work out and after my cycle to work. Rated 5 out of 5 by Deano73 from Great taste, great value and a great way to top up my protein.